Salah is a form of worshipful, ritualized prayer that is performed five times a day during prescribed time periods. Salah is an imperative practice for Muslims. Salah is designed to include physical, mental and spiritual aspects of worship. The purpose of salah is to remember Allah and to be fully present to him. Before engaging in Salah, the worshiper must undergo purification, in particular, ritual absolution, or Wudu. In order to understand the fullness of the Five Pillars, it is important to understand the place of purity associated with all acts of worship in the Islamic faith. Why is purity important in Islam? Outer, physical purification takes two different forms, bathing (ghusl) and ritual ablution (wudu). There are further details here as well, if one wishes to perform the ritual ablution as did the Prophet Mohammad. These are the three bathing activities required by the Muslim scriptures. There are further details suggested, but not required, that reflect the manner in which the Prophet Mohammad performed his bathing. Say bismillāh, In the name of Allah. مِنَ التَّوَّابِيْنَ واجْعَلْنِيْ مِنَ المُتَطَهِّرِيْنَ. What are the Pre-Conditions of salah? There are several, but all collecting around purity - of thought and of body - and intention and focus. you must perform your previously missed ritual prayers before performing the current salah, provided that the number of your missed ritual prayers is less than five and there is enough time for ou to perform them all before the time of the current salah runs out. The physical aspect of the salah consists of starting in a standing position, then bowing, then prostrating oneself, and then sitting. The mental aspect includes the memorizing and repetition of scriptures from the Quran. And the spiritual aspect of the salah consists in the intention for purity and devotion before Allah. There are five different sets of these prayers: dawn, mid-morning, afternoon, sundown, late evening/early night. The importance of the prayers is that they are done regularly, punctually and with concentration and care. The prayers may be done anywhere, provided the conditions of cleanliness and intention are met. 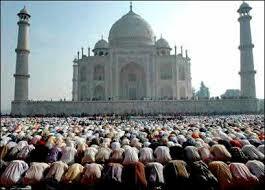 But it preferred that they are done communally in a mosque when possible. There are numerous rules that boundary salah, all of them eliminating distractions: no noise, sneezing, observing others, wiping sweat or dust from the face etc. The salah is completely focused on the task before it – which is to concentrate on God, and God alone. smuka wa-ta ʿālā jadduka wa-lā ilāha ghayruk. Glory be to you O Allāh with Your praises. transcendent. There is no god besides You. أَعُوْذُ بِاللّٰهِ مِنَ الشَّيْطَانِ الرَّجِيْمِ. Aʿūdhu billāhi mina sh-Shayṭāni r-Rajīm. Sana Ullah, a Muslim American is the creator of an Instagram photo series, “Places You’ll Pray” She began it in January 2015 in response to negative feelings that had been expressed towards Muslims praying in public places. See below, both a link to her beautiful Instagram collection and an interview with her about it.